One of these days I’ll get my act together and not wait until the dying hours of the month (and even year in this case) to write these things… With that said, I did manage to have a decent play on a bunch of the biggest December games from 1986 and 1988. I recall playing this quite a bit on the C64. I figured I’d revisit the Amiga version as the screen redraw is unsurprisingly somewhat snappier. My first attempts were complete failures, and I had to resort to reading the instructions (shock horror). The game is still an interesting and enjoyable challenge. The way the procedurally generated levels and progression works means that you never quite know how difficult a level will be (aside from the initial one). There are 10000 landscapes in total with the player starting on “0000”, and when a level is completed the player jumps forward by a number determined by how many resources were left. The difficulty varies tremendously, though each level is - in theory - completable. I say in theory as on one session I hit landscape 0023 pretty quickly, and I’m convinced that one is impossible (I couldn’t find a way to even make the first teleport!). The sense of dread as the Sentinel rotates is still palpable. Zzap!64 took the rather unusual stance of not rating it, instead just awarding it a Gold Medal. I think that was fair enough. It’d be nice to see this re-done on a modern machine with a solid framerate. Reviewed in Zzap!64 December 1986. Before I had my C64 I played this on my Spectrum. 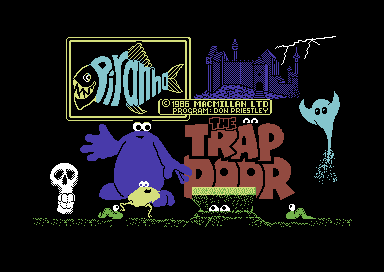 The graphics were very impressive - big, bold characters, and it did a great job of hiding the Speccy’s colour clash. The C64 version is good. I didn’t expect to spend much time on it, but an hour quickly passed. It’s has a lot of character and humour. The one thing that really lets it down is the plummeting framerate whenever there’s a few things going on on screen… which results in slow response times and frustration. Makes me wonder if the Spectrum version suffered from that too. I may have to give this a proper play under emulation where I can crank up the CPU. This was one of the most impressive looking games on the C64 at the time. Coming from the Speccy, it blew me away. As with many games, I never got very far back then. I decided I would rectify that with the use of trainers (naturally). The controls are frustrating.. stand and push fire to throw a rock, stand and push up to jump, but move left and right and hit fire to run and jump etc… what?! When you get the armour and are flying around, the pinball-esque collisions are infuriating. For a game that was a direct result of Dan Malone’s fantastic art, I had naively expected some kind of cinematic ending when the game is completed. Hah! A simple “you win” kind of message and then back to the title screen. Ugh. Not sure it deserved the 93% Sizzler. I think I may have moved onto the Amiga by the time this came around, and so I had never tried the C64 version. I found it completely frustrating. The game is utterly punishing of pixel mistakes and it’s all too easy to end up in situations where you instantly fall off your bike as soon as you respawn. I fired up the Amiga version as that’s the one I remember playing, and that seemed to control better… but it still wasn’t great. Zzap!64 rated it 83% and declared it worth a look if “you’re too old for the real thing”… I think I’m too old for this unforgiving gameplay. This is a game that I often loaded up on my 64 back in the day, but I don’t think I was ever really any good at it - something that hasn’t changed in the intervening years. A fiendishly difficult game requiring super quick reactions, but somewhat enjoyable. I’m sure the music was better… and the scrolling message on the main title screen was a lot longer. I’m obviously confusing it with another game, but what one?? It received a 93% Sizzler. I was sure I would end up spending most of my “revisiting” time playing this one. Boulderdash is such a classic, and this was considered the ultimate version. But… to my shame I never actually managed to play a single level. The main menu (on the game program, not the construction kit) was impenetrable. I’m still baffled as to how one actually starts a game. Seriously. A common theme I’m discovering is how little patience I have for this stuff, so I’ll just take Zzap!’s word for it and maybe I’ll try again sometime. The 97% Gold Medal ranks it as one of the most highly rated C64 games ever . Note: The ST and Spectrum versions were reviewed, but I played it on the Amiga. I’m pretty sure it was a straight ST port (ugh). 91% C&VG? no… a decidedly average ST port. Disappointing. Reviewed in C&VG December 1988, C64. I’ve played many footie games over the years, but the UI of this game totally stumped me. I completely failed to even start a game which wasn’t computer vs computer. I have no idea how that is done. It looked like a relatively deep game, with management being a huge part of it. C&VG scored it 94%, saying it was “an amazing product”. Who knows. Note: The review was of the ST version, but the Amiga one is similar enough. I actually bought this back in the day (still have it!) and played the hell out of it. IK on the C64 was one of my fave games of that period, and IK+ improved on it considerably. It still holds up well. Unsurprisingly, the game now feels rather simplistic as far as fighting games go, but I love that. I love the fact that it is all controlled with a standard 8 direction, 1 button joystick. My only minor niggle is that it could do with some faster/smoother character animation. C&VG awarded it 93%, and for once I would agree with that. There were big changes at the mag, with Tony Takoushi "getting the boot" and replaced by Julian Rignall. This issue hit 114 pages. Mandarin Software were developing "Grand Prix Circuit", an F1 racing sim to be published by Accolade. Elite's lineup for Christmas included "Space Harrier 2" for the 16bits (seems that Grandslam actually had the rights for that, weird) , "Mike Read’s Pop Quiz" and "Storm Warrior". Their arcade truck racer "Supertrux" was narrowly going to miss the holiday season and was due early January. A new arcade attraction in Tokyo saw sit down Outrun cabinets repurposed in a game in which drivers would steer real remote controlled cars around a complicated track. Video from cameras mounted on the bonnet was streamed to the screens. "BAAL" was the next 16bit game due out from Psygnosis. Screenshots certainly looked nice, but would it play any better than their previous offerings? Gremlin's foray into the recently crowded post-apocalyptic-vehicle-combat genre was "Motorway Madness" (maybe it was released as "Motor Massacre" ?). Alternative Software got the game rights to "Postman Pat" and hoped to have it on the shelves by Christmas. "Butcher’s Hill" was Gremlin's take on "Operation Wolf". In what was an apparent first for the UK, a shop called "Software Circus" opened on Oxford St and claimed to be the first computer software only store in the country. Go! managed to get their home computer conversion of Capcom's "LED Storm" on the shelves right on the heels of the European release of the coin-ops. Publisher Softgold, who handled the international marketing and distribution for a bunch of German developers, were touting their upcoming wares. These included takes a deep breath: "Graffiti Man", "Down at the Trolls", "Oxxonian", "Danger Freak", "Starball", "Grand Monster Slam", "Circus, Circus", "The Paranoia Complex", "Mini Golf", "Wall Street", "USS John Young" and "Persian Gulf Inferno". Sony's Video Walkman was due out in the UK in the new year. It would take 8mm video cassettes, sport a 3" LCD screen and last up to three hours on one charge. There was no official price mentioned, but it would likely set you back about the same as a regular VCR. Novagen were about to release their third 16bit game, a scrolling shooter called "Hellbent". This time the programming was being handled by newcomer Donovan Prince (an "unlikely name" according to C&VG), rather than Paul Woakes. "Sticky Decision" was a new shoot 'em up from Gremlin. Meanwhile, they were getting in on the footie market with a game based on "Roy of the Rovers". Magnetic Scrolls were signed up to produce a series of mini-adventure games for Tony Rainbird's "Official Secrets" discount mail order and adventure club. As far as I know, only one materialised: "Myth". I think I may have all of the issues of the club magazine, "Confidential". There was a much larger than usual Arcade Action section. John Minson took a break from ranting to go interview Gerry Anderson about Thunderbirds, Supermarionation and how depressing Hollywood could be. A pilot for "Space Police" was about to be released and Anderson revealed he was in talks for a new Thunderbirds movie. C&VG attended the 3rd annual Festival de la Micro in Paris, which didn't sound terribly interesting. The movies reviewed this month were: "Colors", "Stand and Deliver", "Nico", "The Seventh Sign", "The Hidden", "Taffin", "Bird", "Imagine: John Lennon", "Switching Channels" and "Kansas". A round up of the current offering of footie games. Topping the strategy rankings was "Tracksuit Manager" from Goliath Games, while Sega's "Sega Soccer" narrowly pipped Sensible's "Microprose Soccer" for best arcade. While "Emilyn Huges International Soccer" was reviewed very favourably in this issue, it missed the deadline for the article. Keith Campbell pondered: are adventure games dead? Level 9 was going to start producing fantasy role playing games with graphics along the lines of Sierra games, Magnetic Scrolls were elusive about their plans, while Infocom announced all new adventures would feature graphics. "Operation Wolf" Ocean - ST 91% Spectrum 91% C64 92% C&VG Hit "So what is our advice should you only be buying one coin-op conversion this Christmas? Buy Op-Wolf - it's a brilliant conversion and you will get a lot of fun out of it." "Afterburner" Activision - Spectrum 90% C&VG Hit "Afterburner, is an excellent conversion, and while Keith Berkhill goes for a stroll on water, Spectrum owners at least can revel in one of the fastest and most impressive arcade games to appear in the six-year history of the machine!" "SDI" Activision - ST 81% "SDI is a very simplistic game, but that's where its appeal lies - you can load it any time, put your brain in neutral and blast away until your heart's content." "Savage" Firebird - Spectrum 87% C64 78% C&VG Hit "Savage is definitely one of the best arcade games yet seen on the Spectrum. If you don't buy it, it's not worth your while having a Spectrum. Savage could be the game that puts development house Probe well and truly on the map. Congratulations are due all round." "Emilyn Hughes International Soccer" Audiogenic - C64 94% C&VG Hit "The best way I can describe EHIS is to say that Audiogenic has taken the style of graphics from International Soccer, made them much better, added myriads of extra frames of animation and new moves, blended in the league and cup bits from Matchday 2, put in a spot of Tracksuit Manager options here and there, and come up with quite an amazing product." "International Karate+" Archer Maclean/System 3 - ST/Amiga 93% C&VG Hit "Some may say that beat 'em ups are past their prime, but I defy anyone to pick this up and not get totally hooked. It's got all the elements of a classic, and has the timeless gameplay that'll keep you coming back long after 'big' games like R-type and Starglider II have been relegated to the software shelf." "Red Storm Rising" Microprose - C64 93% "Red Storm Rising is ace, fab, brill, wicked and totally awesome. Well up to the Microprose standard of quality sims. I can't wait for the next one." "Laser Squad" Julian Gollop/Target Games - Spectrum 97% C&VG Hit "Laser Squad is one of the hottest games I've ever played. If that isn't enough, Target is releasing expansion packs for the game, with more scenarios and ideas. Me, I want to see a construction set."